Interview With the Actor Playing Jack Parsons’ Father-In-Law – Zero Equals Two! Here’s yet another video interview with a cast member of CBS All Access’ Strange Angel series. 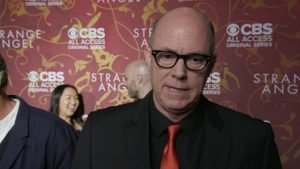 Actor Michael Gaston discusses what sets this role apart from other acting jobs he’s had. Gaston plays a character called “Virgil Byrne,” Jack Parsons’ father-in-law. As Jack’s first wife was Helen Northrup, his second (on an extra-legal basis), Helen’s younger sister, Sara, and finally Marjorie Cameron… this is another fictional character. The interview makes some interesting points about social progress NOT being linear and progressive, but coming in waves, with progress receding or even reversing after eras of forward movement (as some would view ’em).